» The Eagle Has Landed! Was it really just over a year ago that Tin Man Neil and Richard Ford pitched a Judge Dredd gamebook to Jason Kingsley, CEO of Rebellion? A month or two later, the contracts were signed and Nick Robinson and German Ponce were brought on to the team to write and illustrate respectively. Richard had worked with both of them on the Judge Dredd role-playing game for Mongoose Publishing and it was important that we built up a team that not only had worked together, but also knew the 2000 AD universe inside out. Sadly Richard had to drop out shortly afterwards as he went and signed himself up for an amazing three-book deal with Headline for an epic fantasy trilogy. He’s just currently finished his initial draft for the first book and we wish him the very best with it and hope to have him back into Tin Man action in the future! In November, both Neil and Ben did a presentation at GCAP 2011 in Melbourne called ‘Building the Brand’ (video here), where they formally announced the deal with Rebellion for a Judge Dredd gamebook. Nick Robinson then took over the reins and worked for a number of months writing the bulk of the interactive story. While the story was excellent, we felt that we needed a few design changes to our usual GA fantasy books, so the decision was made to modify encounters involving shootouts. 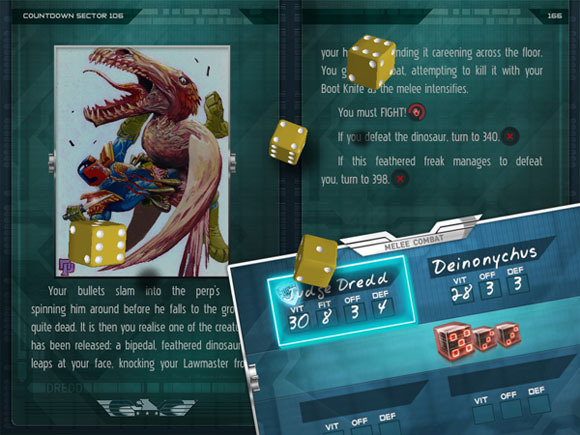 This added increased the workload (and development time) for Ben, Nick and Neil, but ultimately it was a good move as it not only broadens our combat options in future Gamebook Adventures titles, but also speeds up gameplay in Dredd, adding in options for the player so that they can choose how they deal with shootout encounters. Do you choose to try and take down all of your enemies in one go, or just one at a time, risking getting shot by the remaining perps? Creating Judge Dredd: Countdown Sector 106 has been a mammoth effort and easily our most intensive gamebook to date. Lots of very talented people have put in a lot of hours, so we just want to thank Nick Robinson, German Ponce, Dan Maxwell, Bubba Zebill, Adrian Watkins, Ariel Magnes, Clint Langley, Kevin Powe, Cameron Rogers, all of our testers and Rebellion for giving us the chance to bring this to life. We’re very proud of this one and hope you’ll enjoy it too! 2000 AD Online – Offical Press Release! PocketGamer Review – “Funny, rewarding, and pleasantly violent, Judge Dredd: Countdown Sector 106 replaces the rattle of gunfire with the rattle of dice, and it just works.” – 8 out of 10! PocketGamer Silver Award! Starburst Magazine Review – “By Grud, its good.” – 8 out of 10!